Top is white with pleated front, decorative button in the centre and navy trim on collar. Bottom is navy will two pocket flaps. Emile et Rose rabbits logo on the ankle. Buttoned at rear and groin. Comes with wooden hanger (The wooden hanger will not be shipped to Australia due to custom restriction). Ideal Christening outfit, gift or smart wear for occasions. 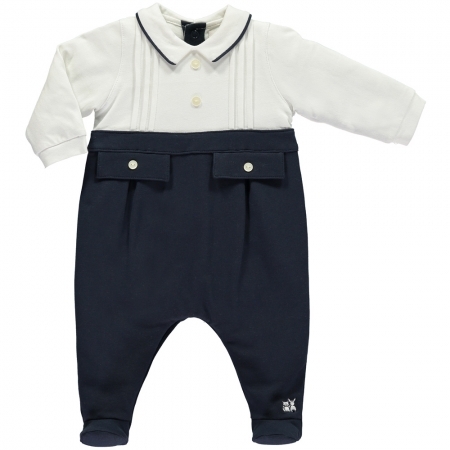 This baby boys outfit is from the Emile et Rose Autumn Winter Baby Collection.